The practice of encouraging and empowering employees (or in professional services, your lawyers, architects, accountants, consultants and other professionals) to share corporate messaging and content on their social media accounts is called employee advocacy and it’s a fast-growing strategy among high-growth companies. Employees have, on average, 10 times more first-degree connections on LinkedIn than your company does. People trust other people more than they do corporate brands. In a survey, 76 percent of people said they’re more likely to trust content shared by “normal” people than content shared by corporate brands. Content shared by your employees receives eight times the engagement of that shared by corporate brands. According to the Edelman Trust Barometer, your employees are three times more trusted than your CEO. Companies that empower their employees to share content are two times more likely to experience revenue growth greater than 20 percent. The most successful sales reps share 23 percent more content than their peers. Salespeople who regularly share content are 45 percent more likely to exceed quota and 57 percent more likely to generate leads. Leads developed through employee activity on social media convert seven times more frequently than other leads. Socially engaged companies are 58 percent more likely to attract top talent. In a company with 500 to 1,000 employees, an eightfold increase in employee sharing leads to sixfold increase in content engagement, which leads to three times more job views and applications, which leads to 30 to 90 new hires. So we agree that empowering employees to share content is a good and necessary thing. How should you go about it? Encouraging social sharing won’t work if your company culture is lacking. Your focus should be on encouraging and empowering employees to share your content — not forcing or paying them to do so. Social media is by its nature a personal medium, built on authenticity. Thus, your employee advocacy program must be optional. Employees should be driven to share by a genuine desire to showcase where they work and contribute to the company’s success. Your leadership should set the tone. If you are asking employees to share the company’s content with their social networks, why would they if your leadership doesn’t? A host of employee advocacy tools have sprung up over the past few years. These tools get your content into your employees’ hands and make it easy for them to share. Some also have “gamification” features that reward and recognize employees for sharing content. Breanna Jacobs provides a great overview of some of the top tools in her post, 10 top employee advocacy tools to increase brand reach and ROI. Other tools not mentioned in Jacobs’ post include Dynamic Signal, ClearView Social, GaggleAMP, Sociabble, SocialChorus and DrumUp. Most importantly, look for a tool that makes sharing effortless. Employees will view social sharing as yet another task not included in their job description if they have to remember multiple passwords or click multiple links to share content. If you’re not ready to invest in software, distribute a weekly email with a list of links and messaging pre-written for their use (although optional). Some employees won’t know what to say and will appreciate suggested language that they can tailor for their own posts. Provide a variety of content so that employees can choose to suit their tastes. From recent news coverage and corporate blog posts to bylined articles, relevant industry news and pictures of company events, employees should be able to find content that suits their own style and preferences. Identify a group of passionate, influential employees to start your employee advocacy program. These should be people who love what they do, are already active on social media and will be excited to share your company’s content. As you roll out your employee advocacy efforts, remain realistic. You’ll never get all of your employees on board. Aim for 20 to 30 percent of employees participating. Employees will rightly be afraid of inadvertently making social media mistakes. They’ll also be unsure of what to post, how often and where to post it. If you don’t already have a social media policy in place, now’s the time. If you do, update it for advocacy efforts. In addition to showing them how social sharing benefits the company, clearly explain the benefits of growing their own networks and personal brands. No employee wants to be seen as a corporate shill. Just as you do with your company social media, integrate a mix of non-promotional, third-party content into your curated selections for employees to share. Industry articles from major media outlets such as The Wall Street Journal or Forbes and your industry’s trade media can form the foundation of this content. Aim for a mix of 60 to 70 percent branded content (news about the company and content created by the company), with third-party content filling out the rest. While your employee advocacy program should be optional, you should consider implementing a rewards program to encourage and recognize employees for sharing. Identify and promote the past week’s biggest sharers, offer prizes/rewards and “gamify” the process, while never shaming or punishing those who choose not to participate. What works in your company or firm? 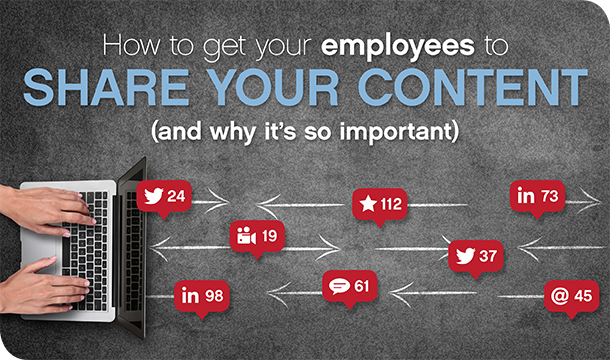 I’d love to learn how you encourage your employees and professionals to share your content. Email me at michelle@rep-ink.com or call 904-374-5733.